This exceptional book, published here in an accessibly priced paperback format, comes out just as the shift to digital photography threatens to render the contact sheet obsolete. 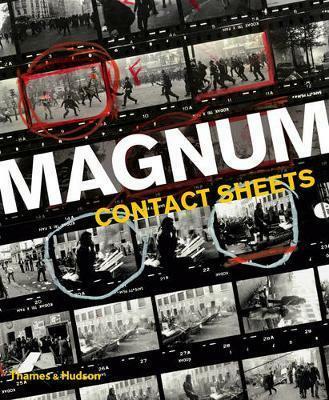 It celebrates the contact sheet as a fascinating way of accompanying great photographers as they work towards, and capture, the most enduring images of our time. 139 contact sheets, representing 69 photographers, are featured, as well as zoom-in details, selected photographs, press cards, notebooks and spreads from contemporary publications, including Life magazine and Picture Post. Further insight is provided by texts written by the photographers themselves or by experts chosen by members' estates. It includes many greats of photography, among them Henri Cartier- Bresson, Elliott Erwitt and Inge Morath, as well as Magnum's latest generation, such as Jonas Bendiksen, Alessandra Sanguinetti and Alec Soth. These photographers cover over 70 years of history, from the D-Day landings by Robert Capa and the Paris riots of 1968 by Bruno Barbey to images of Che Guevara by Rene Burri, Malcolm X by Eve Arnold and classic New Yorkers by Bruce Gilden. Kristen Lubben, former longtime curator at the International Center of Photography, is now executive director of the Magnum Foundation.